Dental implants are well-accepted and long term solution for replacing missing teeth. Placed directly into the jaw bone, a dental implant provides replacement for the root of a missing tooth or teeth. A dental implant can support crowns or dentures, in a similar way that roots support natural teeth. Usually made from titanium, dental implants have an internal screw that holds false tooth (or teeth) in place. Once the implant is fitted, surrounding bone grows up and attaches to the implant, and keeps it in place. Dental Implants have a better look and feel than traditional options such as dentures and bridges. They also offer better biting experience. If you have several teeth missing, chewing properly can be difficult. Replacing multiple teeth with dental implants is a credible option that can boost your confidence , giving you freedom to choose any type of food without getting concerned about a moving denture or uncomfortable sensations. Implants can also be used to support dentures. Usually, when dentures are used without implants, they become loose over 5-10 years. This is due to the changes in the shape of the bone over time. When using implants to support dentures, this provides more confidence to the wearer as dentures are attached to the implant and are not going to move. The physical presence of the implants help with stopping bone loss and therefore everything fits with more comfort in the mouth for longer period. A traditional denture is made to a certain size so that it has the best chance of holding well in place in the mouth. 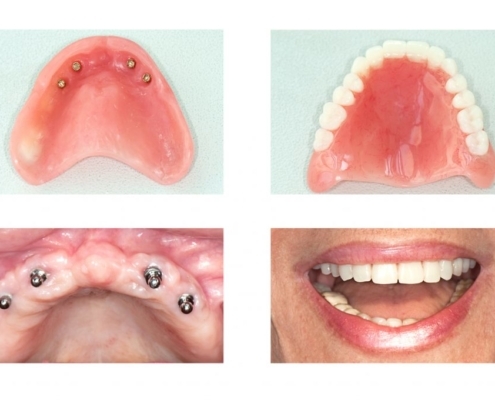 In comparison, Implant supported denture are smaller and more natural making wearer more confident and less conscious. With a team of qualified and caring people, who are passionate about patient care, Dental Care Clinic is a perfect choice for exploring your options for Dental Implants and Tooth Replacement. Working with a team rather than one dentist, you can be sure that you will receive the best quality care by professionals who are patient, friendly and customer focused.